The Gospel changes everything. When you accept God’s salvation, He no longer sees you as an unworthy sinner. But I often encounter Christians who hold onto their old self-image. We have been sanctified through the offering of the body of Jesus Christ once for all. For by a single offering he has perfected for all time those who are being sanctified. Therefore, you are both perfect and being perfected. You’re becoming perfect in a way that you can’t reverse the process and become imperfect. Jesus is Lord and He lives forever to intercede for all believers. Previous sacrifices by human priests had no power to save. But through Jesus, you are perfect for all time. That means your sanctification is a done deal. Jesus paid the price for your perfection. He paid it one time, for all time. Then later in Hebrews 10, there is a hint of a warning to not fall away from your faith. When you read Hebrews 10 you must decide who you are. Are you of the people who don’t shrink back? You preserve your soul through your believing faith. Put your faith in Jesus. Keep your faith in Jesus. You are truly saved, safe, and secure when you entrust your life to Him. Where there is faith and the Spirit of God, there is freedom and there is no longer condemnation for sin. Your sin can’t prevent you from keeping your eternal life. What assurances of eternal life do you have? I recently wrote that you need to be careful how you view yourself when you interpret scriptures. To the degree you doubt whether you are saved, you increase the chance that you’ll interpret the Bible incorrectly. The way to be saved is believing that Jesus is the Christ. If you have doubts about your salvation, you’re probably not saved. But if you’ve made this declaration and you know in your heart it is true, by faith, then you have been born of God. 1 John says clearly that once you cross over to being a believer, you can know you have eternal life, with confidence. Chapter 5 drives this point home. But even earlier in Chapter 1, John provides the formula for having complete joy: to have eternal life and fellowship with the Father and the Son (verses 3 and 4). John says he is writing so that your joy may be complete (1 John 1:4). Later he writes so that you may know you have eternal life. I write these things to you who believe in the name of the Son of God, that you may know that you have eternal life. And this is the confidence that we have toward him, that if we ask anything according to his will he hears us. I’ve skipped over a difficult passage about a “sin that leads to eternal death.” I will address it in a future post. For now, focus on the positive. Reread the verses I did select. Verse 18 is especially reassuring. 1 John 3:6 makes it clear that those who keep on sinning (with hardness of heart and without repenting) never had salvation. If you have any doubts also consider verses 5:1 and 5:13. If there is a way to lose salvation, the only way would be not believing and trusting in Jesus Christ. God promises you eternal life as long as you keep in your heart the gospel message which you heard when you became a Christian (see 1 John 2:24-25). This should be the very thing we as believers are eager to do. Matt’s third book is now available for purchase. 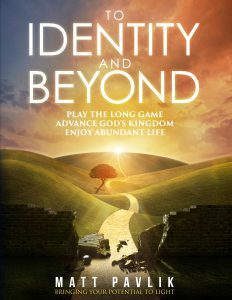 If you struggle to know the importance of your God-given identity, To Identity and Beyond is a must read. This post is part of a series on eternal security. If you’d like some background, you can read the introductory post: eternal-security-why-or-why-not. God gives the believer His Holy Spirit. A genuine believer can know he or she is eternally secure because of Ephesian 1:14. You become a genuine believer by hearing the word truth, which is the gospel, and believing the truth. This provides you eternal salvation. As soon as you believe, God seals you with His Holy Spirit so you can feel secure. God personally guarantees your inheritance until you receive it. If God is the guarantor, can there be any doubt He will keep His promise?